Wattles ( Acacia species, MIMOSACEAE ). They pupate in a cocoon covered in red hairs from the caterpillar. 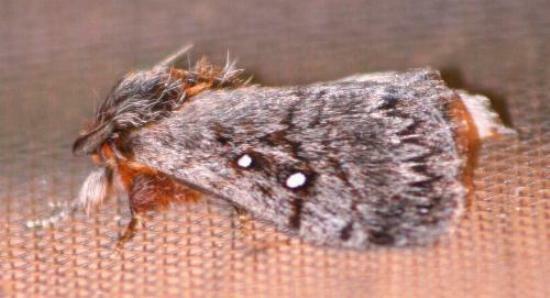 The male and female adult moths of this species look different. They both have grey forewings, but with different patterns. The hindwings are quite different, but they both have an orange hairy abdomen. 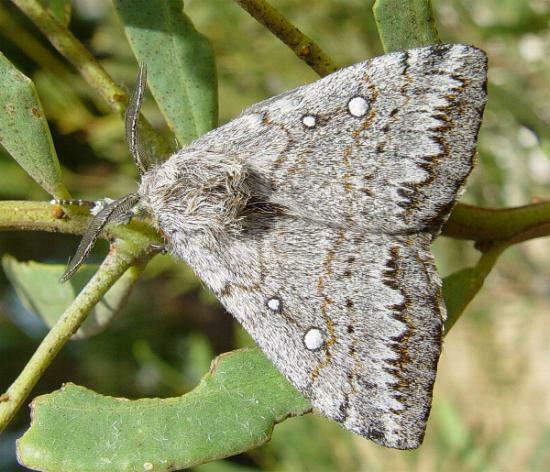 The male moths have indistinct dark lines across each forewing with two white spots. The hindwings of the males are pale yellow with a broad dark grey margin, and each hindwing has a dark line across the middle. The wingspan of the male is about 6 cms. The female moths also have indistinct dark lines across each forewing, and two white spots, but also have a white submarginal zizgzag line on each forewing. The hindwings of the females are grey, and each hindwing also has a a white submarginal zizgzag line. The wingspan of the female is about 7 cms. Melbourne University Press, 1990, pl. 13.8, p. 395. Entomological Society of Victoria, 2008, pp. 22-23. Volume 14 (1891), p. 191.